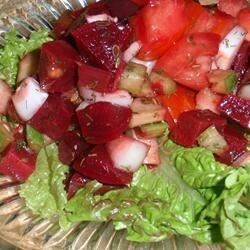 "Fresh dill goes great with tomatoes and beets. Such a refreshing salad for a hot summer evening. Add other vegetables, if you like." Love tomatoes,love beets. Did NOT CARE for this combo. Will NOT MAKE THIS AGAIN! Great recipe! I used fresh beets and tomatoes from my garden and only used olive oil. Outstanding, whole family loved it. Will be making again and again. Thanks cookingqueen. I loved this recipe and it has become a standard at our house. The flavors blend wonderfully together.